I found a place more beautiful than any I’d ever seen. I first came across it while building sandcastles with my children. I showed them how to dig down to the wet sand beneath the surface. We raked our fingers through it, creating rivers and roads. The sand clung to my skin and told me of a place beyond fear and striving. “This place is pure,” it told me. I taught my children how only a gentle touch can shape the castles. “This place is tender,” it said. I told them about the rocks, creatures, wind, and currents that helped to create the sand. “This place is timeless,” it said. And for just a moment, with buried hands and feet, I felt it. A peace more pure, tender, and eternal than any I’d ever experienced flowed from the center of my heart. The sand only kissed me back and waved goodbye. I’m still finding sand in the house, hidden under the bath mats, tucked away in the toes of our shoes. “It’s still there,” it says to me. I found that place again in the parking lot. When I closed the trunk and looked up at the blue morning sky, a white moon grinned at me from it’s resting place above the city. I walked to the intersection and waited for the light to change. I glanced up at the moon again. “This place is whole,” it told me. I continued on my walk, picking up the pace as the clock chimed eight. “This place is vast,” it said. I took the stairs two at a time. The moon waited for me to catch my breath when I reached the top. “This place is flawless,” it said. And for just a moment, standing outside my office door, watching the moon fade into the sunlight I felt it. A harmony more whole, vast, and flawless than any I’d ever experienced flowed from the center of my heart. I wanted to stay in that feeling forever, cracking my heart wide open and bottling it up. “Where? Where? Where?” my heart asked with each beat. The moon only grinned wider. I looked through the window all day, hoping to catch a glimpse of the moon’s secrets. That night, as I ushered my children to bed, my son called out to me from the bedroom, “I see the moon!” Sure enough, there it was, grinning at us through the window. “It’s still there,” it said to me. And just yesterday, my usual path through campus was blocked by construction. A quick detour took me through a rose garden. Yellow and pink roses mingled there, opening their petals in salutation and turning their faces to the sun. In unison, they told me of a place of immeasurable value and infinite beauty. “This place is luminous,” they told me. I stopped a moment to take a picture. “This place is incomparable,” they said. I closed my eyes and basked in their sweet fragrance. “This place is limitless,” they said. And for just a moment, in my private sanctuary, unaware of the streetcar in the distance or the crowd passing by, I felt it. A limitless beauty more luminous than anything I’d seen flowed from the center of my heart. I approached the biggest, brightest rose and touched its petals. Maybe I can pick it, I thought, to take this beauty with me. But my fingers wouldn’t move. “Where? Where? Where?” they asked the rose, trembling. The roses only giggled to each other. Last night, as I washed my hands at the kitchen sink, my daughter surprised me with a hug and drawing of a flower person. “It’s still there,” it said to me with a wink. Deep in the center of our hearts is a place where incomparable beauty, the purest intentions, and the brightest light flow. In this place, body and spirit meet. 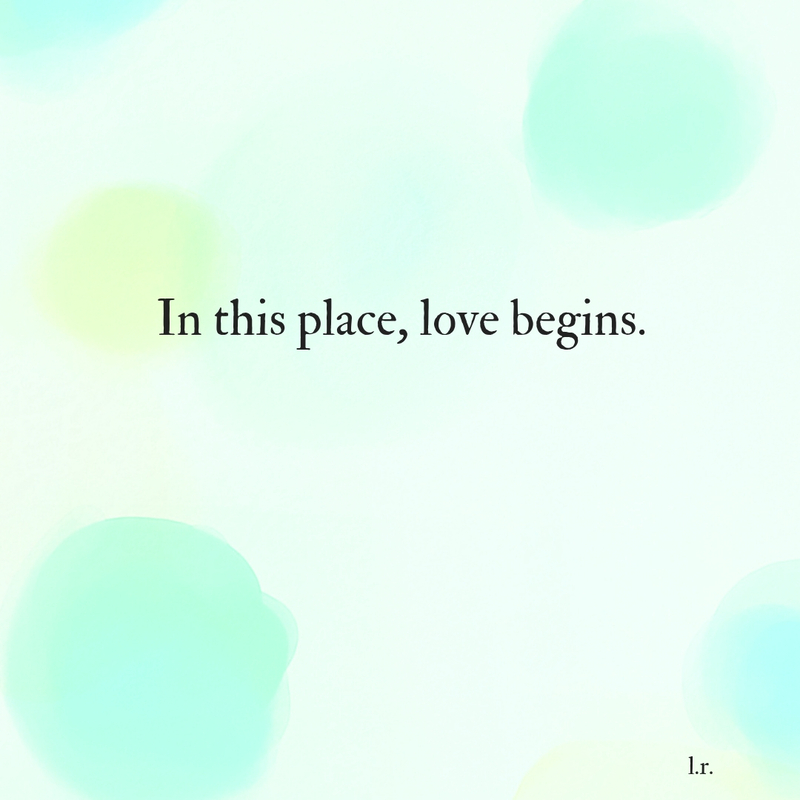 In this place, love begins. In this place, we see our immeasurable worth. There, we face our beauty head-on. That place is in you and me, but sometimes, we might need a little help finding it. So, at least once a day, go to the places that know the way. Let your body touch the earth in whatever way it can. Go where there is sunlight. Make a point of seeing the moon every night. Find a pocket of quiet in the day. Sing in the car. Cook with fresh herbs. There are infinite paths waiting to lead you back to that place in you. Previous Post: « Brave the stillness. Come back inside.